Alarm clock apps can be quite practical, helpful and efficient especially when it comes to people that are always late and need help being on time. While there are thousands of alarm apps available in the Play Store, no one really has the time to go through and test all of them. So this is where we step in to help you select one from a list. We searched for the perfect alarm app and we discovered one amazing app that offers you more than just a simple alarm clock. Let’s see what the app offers you. What is this app about? 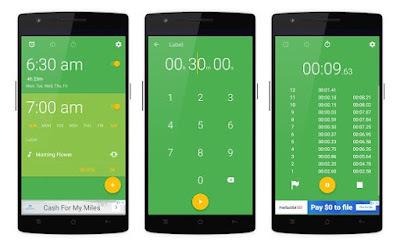 This productivity app is developed on android platform and specially created as one amazing and efficient alarm clock app which is offering its users additional features like a stopwatch and timer as well. The app’s features offered are very simple, practical and easy for using, giving the users a chance to customize them with many different themes offered by the app. With the app, users are getting 3 different tools inside one incredible and simple app, all available for free on their Android devices. Why do we choose Light Clock? Light Clock for its users has to offer an alarm clock which is more than just that but also is offering additional features like the stopwatch and the timer. All these app’s features offered can be easily customized by the user by choice, offering him a chance to choose between numerous themes available. Using this alarm clock allows users to get their favorite music, sound or tune to wake them the app and set multiple alarms with even using a snooze option too. On the app, each user can set an alarm time, a maximum number of snoozes and more than that, all with using just one app. With the timer available within the app, users can choose to set it in exact time, countdown and repeat because of the loop timers available and with that, each user gets a perfect time for any situation he needs it for. When it comes to the stopwatch, the app offers it with up to 99 hours duration. Users will set alarms as it suits their needs and use the stopwatch and timer as they please, all available in one app directly on their phones. Download the app on Google Play for free to use an alarm clock with timer and stopwatch features!